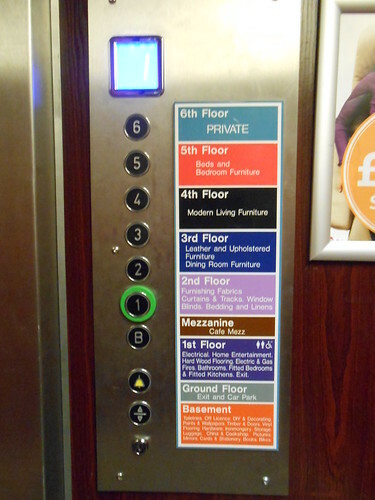 What button to press to get to the ground floor? Does the lift stop at the ground floor? Englishman Hart developed idea of a continuous human bucket elevator called “The Paternoster.” 1884 — J & E Hall installed the first Cyclic lift (Paternoster) in England. Things are developed and possibly patented at different times in different countries, with different names and different design details, the US patent for a Paternoster style elevator was granted in 1934. In the early 1980’s Aston University’s main science building had a working Paternoster inside to the left of where where the external ‘sky lift’ was added in the late 1980’s. I vaguely remember that it ran between the 2nd and 7th (top) floors. It was good fun jumping on and off the ever-moving Paternoster, especially during the then annual Charter (May )Ball in the early hours of the morning wearing a ball gown and under the influence of cheerful freinds and alcohol. Many people would not use it because it just didn’t look safe.